Reactive Ion Etching Systems | RIE Etch Process | Plasma Etch, Inc.
What is Reactive Ion Etching? Reactive ion etching (RIE) is a directional etching process utilizing ion bombardment to remove material. This etch process is commonly used in the manufacturing of printed circuit boards and other micro fabrication procedures; the process uses a chemically reactive plasma in a vacuum chamber to aggressively etch in a vertical direction(down). Horizontal etching is purposefully minimized in order to leave clean, accurate corners. RIE systems are used to remove organic material and etch away treated surfaces. An understanding of the RIE process will help in determining what plasma equipment will best suit your needs. The most notable difference between reactive ion etching and isotropic plasma etching is the etch direction. While RIE provides a much stronger etch, it also provides a directional etch. The plasma will etch in a downward direction with almost no sideways etching. This is especially important when etching circuit boards and other applications where a sideways etch would be undesirable. This is also one quality that sets plasma etching apart from any other etching process. 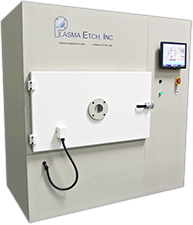 Plasma Etch provides superior equipment for virtually all plasma processing applications, and we’re proud to say that we have some of the most effective plasma etching systems in the industry. Controlling ion density, electron temperature, and the plasma potential are of the utmost importance for ensuring a uniform etch. Our systems are built around a durable vacuum chamber. The electrode holds the materials to be treated and is electrically isolated from the vacuum chamber. Air or gas enters the chamber through a control valve on the front and is quickly evacuated by the vacuum pump installed in the rear. The type of gas used varies depending on a number of factors. Carbon tetrafluoride (CF4) and oxygen are commonly used for etching. Plasma is produced in the system by applying a strong RF (radio frequency) electromagnetic field to the electrode, generally at 13.56 megahertz. Other frequencies are available, but 13.56 MHz provides the best results for this etch process. The RF is applied, creating reactive plasma by oscillating the electric field and ionizing the gas molecules by stripping them of electrons. The electrons are electrically accelerated up and down in the vacuum chamber in cycles, striking the upper wall of the chamber and the wafer platter. The much more massive ions move relatively little. Some of the electrons are absorbed into the chamber walls. The chamber is made of aluminum and grounded so they exit the system continuously during the etch process. Electrons deposited onto the platter create a negative charge due to the platter's isolation. The negative charge develops a negative voltage on the platter of a few hundred volts, creating plasma with a slightly positive charge. The positively charged plasma is a result of the higher concentration of positive ions compared to free electrons. The positive ions tend to drift toward the wafer platter due to the difference in voltage. They then collide with the samples to be etched. The ions react chemically with any organic material on the surface of the samples, stripping the organic matter from the material. The organic matter is then pulled away by the vacuum pump and removed from the etcher. The ions can also remove some material by transferring their kinetic energy. Etching conditions in an RIE system are adjustable on many levels based on gas flow, pressure, and RF power settings. Each manufacturing process is different and each customer will generally have a slightly different procedure for their etching needs. Higher pressure will etch faster. Faster etching can also be achieved by raising the temperature of the chamber during the reactive ion etch process. We offer temperature controlled systems that can either raise the temperature for faster etching times or lower the temperature for products with temperature sensitive components. Temperature control also keeps a uniform temperature throughout the chamber, resulting in increased uniformity. Temperatures are easily and consistently controlled by our proprietary, in house software. 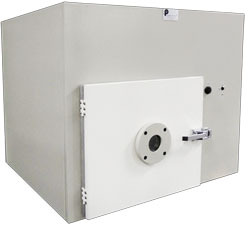 We design and manufacture plasma systems to meet the needs of many industries. All systems are built-to-order and can be customized for each client. Companies depend on our plasma treatment systems to deliver fast, high-quality etching, mitigate plasma damage, and provide unparalleled uniformity. We pride ourselves on working hands-on with our clients to provide the most effective machinery for their applications. 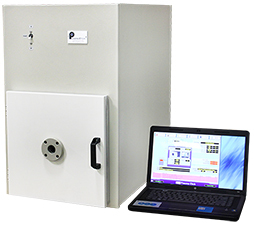 Our objective is to be able to provide affordable plasma processing solutions for every task. We build a wide range of reactive ion etching systems to ensure that your size, volume, and etch process requirements are covered. Most of our base platforms can be configured and customized specifically to the customer’s demands. Please contact us or browse our systems page to find a system that suits your needs. The BT-1 is our most popular solution for industrial etching.